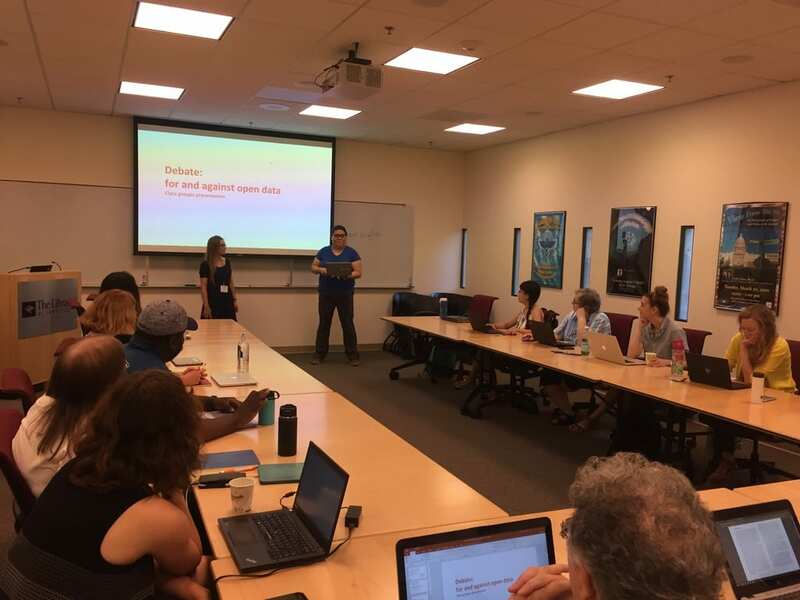 This summer saw the second FORCE 11 Scholarly Communication Institute (FSCI) held at the University of California, San Diego, which I had an amazing opportunity to attend. Participants of the FORCE 11 summer camp selected three courses from an extensive course list; morning classes ran through the whole week, afternoon ones took place over two days. For my first afternoon course, held on Monday and Tuesday, I attended the workshop Open South: The Open Science Experience in Latin America and the Caribbean, which was taught by a group of librarians and researchers: Gimena del Rio Riande, Researcher from Instituto de Investigaciones Bibliográficas y Crítica Textual (IIBICRIT), April M. Hathcock, Scholarly Communication Librarian from New York University, Wouter Schallier, Director of Hernán Santa Cruz Library and Daniel O’Donnell, Professor of English at University of Lethbridge, Canada. We learnt about the long history of Open Science in Latin America and the Carribean, and discussed national laws in Argentina, Brazil, Mexico and Peru that seek to make scientific knowledge produced with public funds openly available. The instructors also highlighted regional projects such as Scielo (collection of open access journals from 14 countries) and redalyc.org (another platform of open access journals, created by Universidad Autónoma del Estado de México). The projects play an important role in making open access the most established communication model in the region. At the end of the workshop we discussed how to make the Open Access movement more inclusive, how to bridge the gap between the Global North and the Global South. The classes made me reflect on how limited my view of Open Science was, and I realised rich the movement is outside of Europe and North America. One of more interesting initiatives is South-South Programme ran by CLASCO that integrates a network of researchers from the Global South. 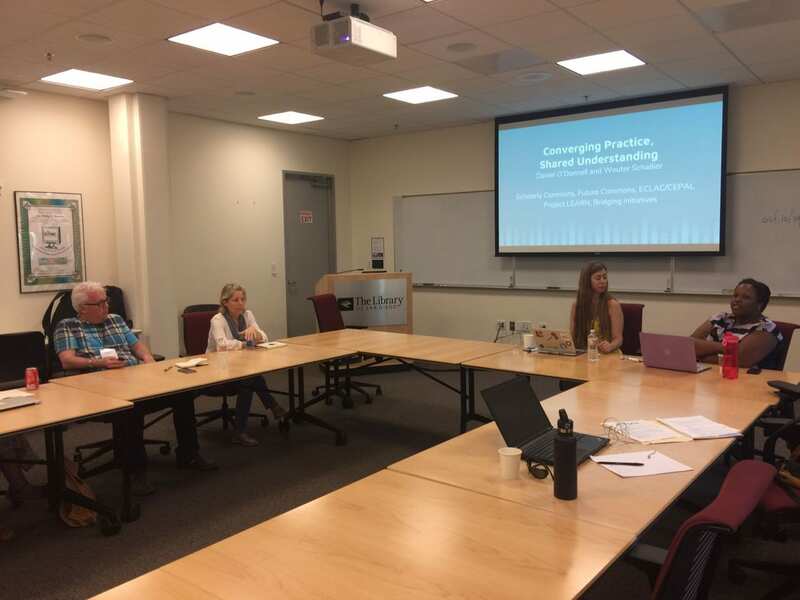 Micah Vandegrift, Open Knowledge Librarian at North Carolina State University and Samantha Wallace, PhD candidate in English at University of Virginia led my Wednesday – Thursday workshop on Public Humanities as Scholarly Communication. Discussion in the class focused on two texts: Kathleen Fitzpatrick, Giving it Away: Sharing and the Future of Scholarly Communication and Sidonie Smith, Manifesto for the Humanities: Transforming Doctoral Education in Good Enough Times. 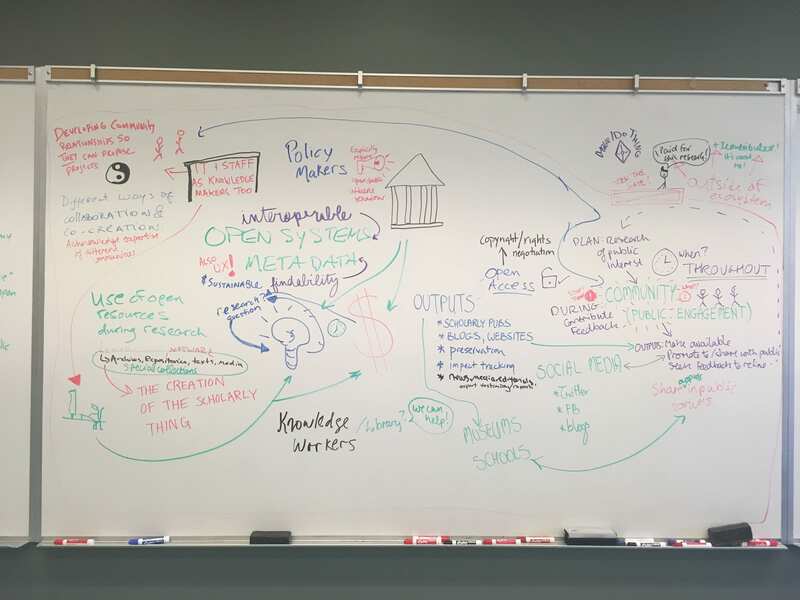 The class turned into a brainstorming exercise; we are used to discussing Digital Humanities, but Public Humanities go further than Digital Humanities and securing Open Access for publications. There was a long and thought provoking discussion on nature of humanities, and the public, where we reflected on the role of the public in public humanities, and how public is intrinsic to humanities. The discussion in turn led to creating a new framework for public humanities, aligned with citizen science, and that would engage public and communities. Further reflections on the class from one of the instructors, Micah Vandergrift, are available here. In the mornings I attended Data in the Scholarly Communications Life Cycle workshops. The class was expertly and entertainingly* run by Natasha Simmons, Program Leader, Skills Policy and Resources at Australian National Data Service (ANDS). The course was structured on the 23 (research data) Things, a self-directed learning programme developed by ANDS, suitable for everyone, regardless of their skills and prior knowledge. The programme is full of resources and fascinating data, have a look yourself here. We started with an introduction to research data (of course!) and discussed data in the scholarly communications lifecycle – this offers a framework for understanding research processes, and a good (interactive) example is available here. We also talked about data sharing models, and challenges around data sharing. For Tuesday’s session Natasha invited Stephanie Simms from California Digital Library, who presented an introduction to data management plans and DMPonline tool. We also heard some open data stories, from Australia Telescope National Facility that makes available images of the sky collected at the facility, and from The PetaJakarta Data Sharing Project that gathers data from social media (in this case Twitter) to collect information about flooding in Jakarta. 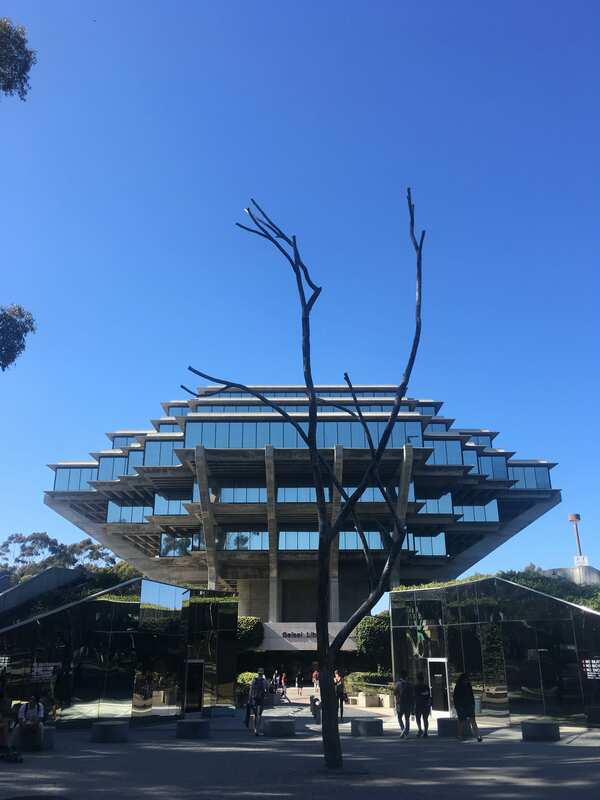 On Wednesday Reid Otsuji from UC San Diego talked about the Open Science Framework and The Carpentries – a way of acquiring new coding and data skills for researchers and librarians. We also talked about making research data FAIR (Findable, Accessible, Interoperable, Reusable), and used FAIR data assessment tool to look at some openly available data. This provoked a discussion on how easy it is to make research data FAIR (not that easy!) and how institutions could provide the infrastructure and support that are required. The following morning we had guest speakers from UC Berkley, Rachael Samberg and Maria Gould, who presented on licensing research data. This was an extremely interesting talk, and discussed copyright and licencing of data both generated and used by researchers. Later in class we discussed issues around personal and sensitive data. On Friday Gustavo Durand introduced Dataverse – an open source platform developed at Harvard that allows researchers to publish, cite and archive their research data. At the end of the workshop Natasha introduced persistent identifiers and their use in data citation, and we explored different citation styles. Hands on exercises throughout the course allowed me to experience working with research data, and see issues around data managment from researcher’s perspective. Guest speakers provided me with an opportunity to gain expert insight into many aspects of research data management, and the course structure allowed for numerous discussion and debates. This in turn made me reflect on how nuanced managing research data can be, not only when it comes to copyright and licencing. *I learnt a lot about Australian wildlife too!